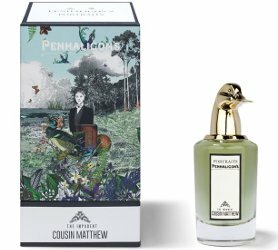 Encased in a grandiloquent glass flacon topped with a gold-tone duck stopper, the Impudent Cousin Matthew eau de parfum by Penhaligon's is fresh citrus fragrance with woody depths. Announcing its presence with sparkling mandarin, it develops with patchouli for a base that is rich and darkening. Penhaligon’s The Impudent Cousin Matthew can be found now at Harrods, £190 for 75 ml Eau de Parfum. Citrus and woods doesn’t strike me as particularly impudent. They could at least have added a bit of cumin to imply he had been cheeky enough to not shower before dinner? Or perhaps the cheek is that he got in to Flora’s fragrances? Because the notes seem identical. It is mostly the duck head that is impudent? One more Penhaligon’s in 2 days? This release, at least, seems to be a male and female version, sort of how Amouage does it, if that makes sense? Well possibly Matthew was out 2 days ago and I failed to notice it at Harrods. Would have been better to announce them both at once. The duck topper is weirdly cute to me. I won’t hold my breath for ‘Cousin Itt’ but wouldn’t that be fun! The long hair, the dark glasses, the little bowler hat! Hmmmm… maybe Twilly will do a flanker! My thoughts exactly. Please just stop. Not doing justice at all to the true history of the name.